The US ambassador to the UN has begun a visit to the three nations worst hit by the Ebola outbreak, criticising the level of international support so far. Samantha Power has landed in Guinea and will visit Sierra Leone and Liberia. She told NBC some nations who offered backing "haven't taken responsibility yet" in supplying aid and doctors. More than 10,000 people have contracted the Ebola virus, with 4,922 deaths, according to the World Health Organization's latest figures. Ms Power told NBC as she boarded her plane: "The international response to Ebola needs to be taken to a wholly different scale than it is right now." She said: "You have countries at the UN where I work every day who are signing on to resolutions and praising the good work that the US and the UK and others are doing, but they themselves haven't taken the responsibility yet to send docs, to send beds, to send the reasonable amount of money." Ms Power told NBC the "mere fact of going as a member of the president's cabinet [shows] that we shouldn't be afraid", adding that her five-year-old son was "obsessed" with Ebola. She will visit national Ebola coordination centres and meet US and UN workers, although it was not clear whether she would meet survivors of the outbreak. 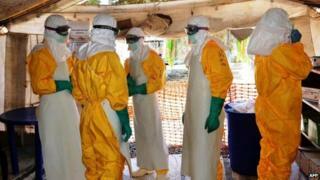 Ms Power last week said the international community "isn't just losing the race to Ebola. We are getting lapped", and even praised Cuba - under a US embargo for decades - for its supply of doctors to Sierra Leone. The Pentagon announced that a new commander, Maj Gen Gary Volesky, had taken over the US military mission to fight Ebola in West Africa. It said that troops from the US 101st Division who arrived in Liberia 38 days ago had established two new laboratories and that a 25-bed hospital should be operational in the capital Monrovia by November. The US has pledged 4,000 troops to build hospitals and to train health workers in West Africa, some 600 of whom have already arrived. However, new rules in some parts of the US on quarantining returning health workers have drawn criticism. A nurse put into isolation on her return from treating patients in Sierra Leone expressed anger at the way she was dealt with at Newark airport. Kaci Hickox, of medical charity Doctors Without Borders, said the experience was frightening, and described seeing a "frenzy of disorganisation, fear and most frightening, quarantine". She said she was kept in isolation at the airport terminal for seven hours and given only a cereal bar to eat. New York, New Jersey and Illinois have imposed stricter quarantine rules than those at the federal level. Media captionObama: "Patients can beat this disease, and we can beat this disease"
In the three states, anyone who has had contact with Ebola victims in West Africa now faces a mandatory 21-day quarantine period. The White House said the states' stricter rules could put off aid workers and others travelling to West Africa to help mitigate the crisis at its source. Although Ms Hickox tested negative in a preliminary test for the virus, she will remain under quarantine for three weeks and continue to be monitored by health officials. The stricter measures were put in place in New York and New Jersey after a doctor, Craig Spencer, tested positive for the virus on his return from Guinea last week. US President Barack Obama said in his weekly radio and online address that Americans had "to be guided by the facts - not fear".